Computer-aided detection (CAD) is widely used and accepted as a solution for marking potential abnormalities on mammography, breast MRI, chest, prostate exams, and more. Over the years, clinical studies have found evidence that CAD marks too many false positives, casting doubt on the efficacy of the technology. Nonetheless, many radiologists say they won’t do reads without CAD; what gives the technology its staying power may be less a matter of absolute science than a matter of perspective. Although the clinical trial was very large, enrolling 684,956 women, many mammography experts saw significant flaws in the study methodology, analysis, and presentation of results. The study looked only at film-screen mammograms, not digital mammograms, which have supplanted film-screen as today’s standard of care. “[The study] is not completely relevant today because it is based on film-screening mammography, and approximately 80% of the facilities currently in the United States are digital,” indicated Stamatia Destounis, MD, Managing Partner at Elizabeth Wende Breast Care (EWBC) in Rochester, NY. Although presented in a negative way, the study results actually demonstrate the effect CAD should have when used over a period of several years; upon introduction, recall rates and cancer detection rates will both increase, as previously unseen cancers are detected. After several years, recall rates and detection rates return to baseline, with the same percentage of cancers being detected,though at an earlier stage. Finally, the study actually found that CAD showed a decided advantage in detection of ductal carcinoma in situ (DCIS), one of the earliest indicators of breast cancer. Although more than 30 peer-reviewed articles published in major scientific journals have shown positive results from historically controlled studies using CAD in a screening environment, the study by Fenton et al, has caused quite a stir—putting into question a widely adopted tool. The Fenton study may be most beneficial by opening discussion on an important question—how is CAD software designed for use in screening mammography? From the perspective of many leading radiologists specializing in mammography, CAD is designed to work like a second pair of eyes, reviewing a patient’s mammogram after the radiologist has already made an initial interpretation. “CAD is another look. It does not interpret the mammogram for you,” said Dr. Destounis. “It’s common sense that a second pair of eyes is going to help you pick up something you might miss. CAD highlights findings that are potentially important,” said Robin Shermis, MD, MPH, Medical Director of The Toledo Hospital Breast Care Center, ProMedica HealthCare in Toledo, OH. Despite the controversy surrounding the efficacy of CAD for mammography, radiologists continue to view CAD as an essential instrument in their toolset. At EWBC, a renowned breast center that performs an estimated 80,000 mammograms annually, CAD has been another useful tool in their screening process since July of 2000. Radiologists there are specialists in mammography, and they have 2 CAD solutions at their disposal: R2 ImageChecker CAD by Hologic and iCAD for mammography. CAD’s purpose and function differ across applications. CAD for breast MRI, for example, serves primarily as a workstation to read cases more efficiently. As a workflow tool, breast MRI CAD helps radiologists manage the large sets of data, it calculates critical measurements, corrects for motion artifacts, characterizes abnormalities on the images, and conveys information to the referring physicians and patients. These automated steps save the radiologists time, enhancing their overall performance. Toggling through the large MRI datasets can result in lengthy reads. To better manage the data files, CAD for breast MRI presents simultaneous axial, sagittal, and coronal views of acquisitions or postprocessed image sets using multiplanar reconstruction (MPR). Users can set up side-by-side comparisons of pre-and postcontrast images. Color maps illustrate dynamic enhancement curves for contrast washout,showing how contrast is taken up and released by the breast tissue. At The Toledo Hospital Breast Care Center, where doctors conduct up to 7 breast MRI exams a day, mammography interpreters rely on the Aurora CAD workstation. If the doctors need a second look with an ultrasound and then need to do a biopsy, Dr. Shermis explained, they can perform an ultrasound and biopsy on the same day as the MRI. CAD provides 3-dimensional registration to compensate for patient motion between data acquisitions. This contributes to more accurate orthogonal and oblique views of lesions for MPR, maximum intensity projections (MIP), and surface-rendering views. “With MPR, you look at findings in the axial, coronal, and sagittal planes. You can get a really good feel for the morphology of a lesion and where it is located. It gives you subtracted views that isolate the areas of contrast enhancement, and you can get these subtracted views in a planar fashion or in 3-dimensions,” said Dr. Shermis. Another unique feature, available on the ONCAD system from Invivo, analyzes MR images to detect invasive and noninvasive suspicious lesions. It also delineates the extent of disease by measuring margin sharpness, a characteristic related to blooming, to help determine the degree of lesion vascularization. Another area of skepticism has surrounded screening for lung cancer. For years, no clinical study had found a significant correlation between mortality rates and screening for lung cancer with either x-ray or computed tomography (CT). But that uncertainty may be clearing up, ushering in a new era for lung screening and CAD. Nonetheless, it remains common practice to look for incidental findings and use CAD when reading chest x-rays. “We take chest x-rays for patients preoperatively; some have pneumonia. But no matter what they are done for, you always look for other findings to make sure there are no abnormal lymph nodes and there are no lung cancers that are not expected,” said Patricia Shapiro, MD,a Diagnostic Radiologist at SouthCoast Medical Group, Savannah, GA, where doctors use CAD for mammograms, breast MRI, prostate exams, and chest x-rays. In 2010, SouthCoast Medical Group performed 3,100 chest x-rays using OnGuard 5.1, a CAD solution designed to identify nodules that may be early-stage lung cancer. In Dr. Shapiro’s experience, the software is capable of detecting nodules < 9 mm, although labeling indicates it is designed to detect nodules between 9 and 30 mm. The false positive (FP) rate for OnGuard is 1.3 FP per image. Dr. Shapiro admitted it is harder to pick up lesions with chest x-rays, but on chest CT screenings they have picked up Stage 1 lung cancerson a number of patients. “Picking up Stage 1 lesions is ‘the Holy Grail,’” she said. The Holy Grail may be in reach according to new findings from the National Lung Screening Trial (NLST), a multicenter, randomized,and controlled trial. Conducted by the American College of Radiology Imaging Network (ACRIN) and the National Cancer Institute’s Lung Screening Study Group, the NLST enrolled 53,000 current and former heavy smokers aged 55 to 74 at 33 sites across the U.S. The study measured the effect of low-dose CT screenings compared to chest x-ray on lung cancer mortality. It found a relative reduction in mortality from lung cancer with low-dose CT screening of 20.0% compared to x-ray on lung.4 The clinical trial demonstrated for the first time that the early detection of lung cancer can save lives. Some of the commercially available CAD for CT lung solutions include syngo LungCAD and syngo LungCARE CT by Siemens Healthcare as well as VCAR by GE Healthcare. 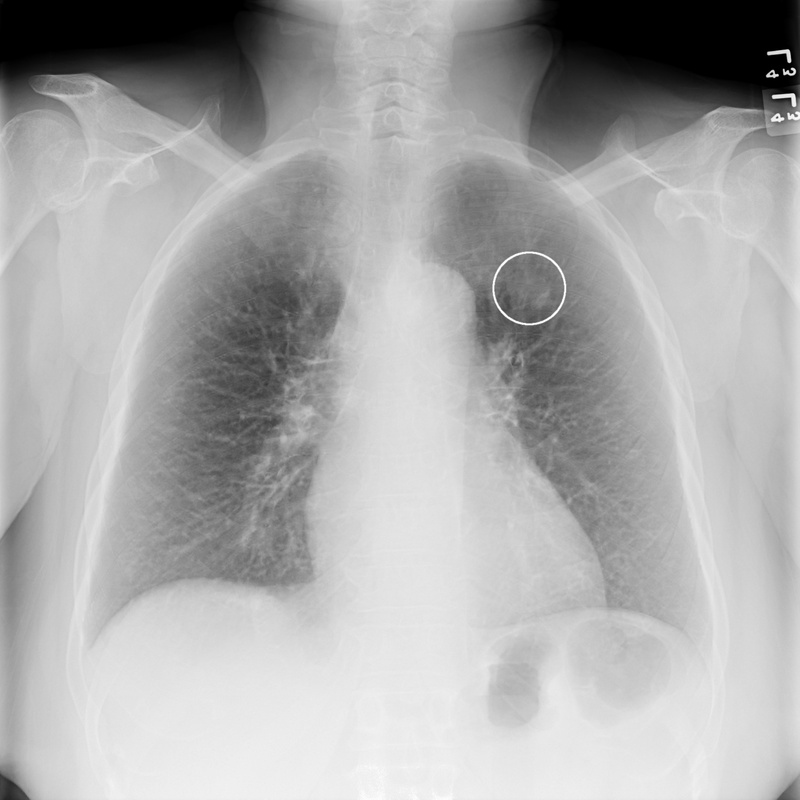 syngo LungCAD, for example, is designed to assist radiologists in the detection of solid pulmonary nodules, while syngo LungCARE CT is a tool to support physicians in confirming the presence or absence of lung lesions and to provide automatic segmentation and volumetric measurements of lung lesions. With CAD established as a permanent fixture in the radiology toolset, many radiologists are looking toward the future and have identified areas where they would like to see improvements. Dr. Destounis, for one, expressed a desire for CAD systems that provide “[i]mproved specificity, less false positives, [and] only show marks for cancer or identify which abnormalities are the more serious ones so I can pay more attention to them.” In addition, she said she would like to see temporal comparisons of CAD over years screened. “If we could do temporal comparisons, we may be able to identify any subtle change in the films over years,” she said. “I think CAD has a lot of information to give us, and we should be able to capture this information and review it for each patient.” An important advancement for CAD for breast MRI, according to Dr. Shermis, would be the capability to distinguish whether an abnormality is new. “It may be helpful to show if a finding were different from prior findings. CAD for MRI, for my personal preference, may be better for postprocessing when there is patient movement—when it looks like an enhancing lesion, but is really not an enhancing lesion,” he said. Rao VM, Levin DC, Parker L, et al. How widely is computer-aided detection used in screening and diagnostic mammography? J Am Coll Radiol. 2010;7:802–805. Fenton JJ, Abraham L, Taplin SH, et al. Effectiveness of computer-aided detection in community mammography practice. J Natl Cancer Inst. 2011:103;1152-1161. National Cancer Institute. Chest x-rays can detect early lung cancer but also can produce many false-positive results. J Natl Cancer Inst. http://www.cancer.gov/newscenter/ pressreleases/2005/plcolungbaseline. Accessed August 29, 2011. The National Lung Screening Trial Research Team. Reduced lung-cancer mortality with low-dose computed tomographic screening. N Engl J Med. 2011;365:395-409. Largest randomized lung cancer screening trial demonstrates screening with low-dose CT reduces lung cancer deaths. American College of Radiology. http://www.acr.org/ HomePageCategories/News/ACRNewsCenter/NLST-Results.aspx. Updated June 29, 2011. Accessed August 31, 2011. Why CAD is here to stay. Appl Radiol.